Brand New Invision DVD remote control and compatible leather-look headphones for your rear seat Invision Revolution 2 DVD system . Remote and headphones are pre-programmed for your convenience. Simply insert batteries and the remote is ready to work for you! If you have lost or damaged your original DVD remote, this is an original replacement part you need. Remember, this only works for Invision installed DVD players. If you have a different aftermarket system, this will not work for you. If in doubt, consult your Invision owners manual - an image of the DVD remote will appear there. Our headphones meet or exceed all original equipment specification, but cost $150 less than those found at your local dealer. Dont over pay for your wireless automotive headphones! Each package comes with TWO headphones. * Leather look padding provides extra comfort and passive noise canceling. These wireless automotive headsets will allow your rear seat passengers to listen to the rear seat entertainment system without disturbing the front seat passengers. You will never have to listen to the same DVD over and over again! If your vehicle is equipped with an IR DVD system, these will work for you! Passive noise-cancelling headphones make use of the noise-canceling characteristics of their materials that are much like the soundproofing materials used in home theater systems. These passive noise-canceling headphones are composed of layers of materials packed with high-density foam and other noise-filtering materials. These soundproofing materials are very effective against high frequency sounds. They are able to reduce noise levels to about fifteen to twenty decibels. This set works great in our 2016 Expedition and no setup was required for us. This was my first time ordering from this company but our transaction went smoothly with quick shipping. We are very pleased with the service and product. We purchased these for our 2013 Lincoln Navigator and they work perfectly. No setting anything up, just install batteries and they're good to go. He earphones are adjustable, comfortable, and fit our 3 year old granddaughter great. Need printed instructions for Remote! The products we received worked great. 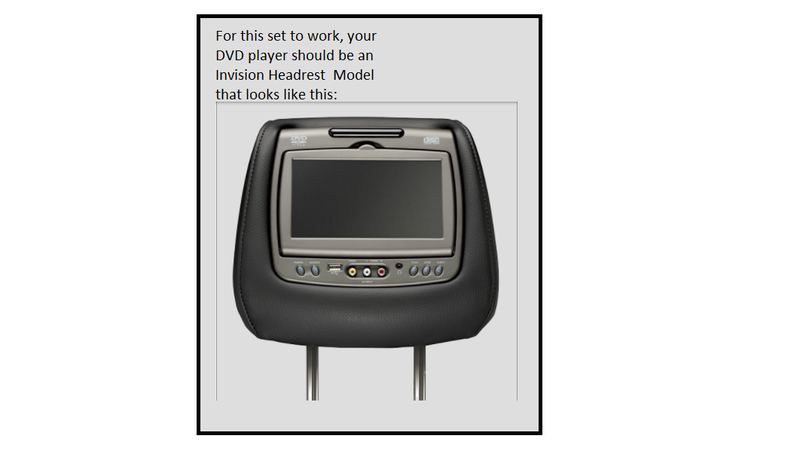 Per our discussion before purchase, the headsets and the remote were tested in our new Lincoln MKT and did their job. The sound quality is very good. Click the button below to add the Invision Headphones and DVD Remote Control Combo to your wish list.